Congratulations to the December winner of a Fujifilm Instax Mini 50S Camera plus film— Steve from Barrier Signs Pty Ltd. We’re looking forward to seeing your photos, Steve! Please don’t hesitate to share your images with us on Pinterest. 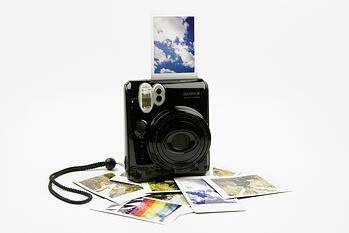 Calling all printers and photographers—want to win your own Instax Mini 50S Camera? For your chance to take one home, subscribe to our Graphics blog here. You’ll get the most up-to-date information on wide format printing and how to make your printing business soar. Don’t forget to share this opportunity with your colleagues, too! Simply subscribing enters them for a chance to win. Sign up here and you may see your name in lights (or at least on this blog!) next month. Only open to Australian. residents aged 18+. Ends 11:59pm AEDST 31/1/15. Max 1 entry/person. Click here for T&C's.